All-terrain vehicles (ATVs) may seem like big toys, but the Consumer Federation of America (CFA) says child deaths and serious injuries from ATVs increased in 2015 (the most recent data available). The group notes that at least 58 children lost their lives that year alone and 26,700 were injured seriously enough to require emergency room treatment. Perhaps this is why the American Academy of Pediatrics recommends that no child under age 16 ride an ATV of any size. If you’re unsure if your child is ready to ride an ATV, a safety website created by the ATV industry offers a checklist to help parents decide when and if their children are ready. Read the CFA’s full report, “ATVs on Roadways: A Safety Crisis,” here. Net neutrality is the principle protecting our free speech on the internet, as well as our ability to surf the web without internet service providers (ISPs) slowing down (“throttling”), blocking or charging extra fees for certain sites and apps. Unfortunately, this fundamental right (which consumers have taken for granted since the beginning of the internet) is under attack by ISPs (including Comcast, AT&T and Verizon), which are aiming to get the Federal Communications Commission (FCC) to turn back the clock on its internet rules. One of our Chinese-speaking advocates was asked to appear on TV to explain the effort. Consumer Action’s Kathy Li was interviewed on KTSF Channel 26 evening news, which broadcasts to Chinese communities in the San Francisco area in both Cantonese and Mandarin. She pointed out that in addition to higher fees and slower speeds, a loss of net neutrality could lead to biased or less diverse information/news presented to the public (due to the “pay-to-play” strategy the carriers would employ). Consumer Action joined the effort by engaging in a tweetstorm pointing out important aspects in the fight for net neutrality, like how FCC Chairman Ajit Pai, selected by the Trump administration, hasn’t even declared whether or not he will enforce existing net neutrality laws. We also applauded legislators who have spoken up in support of net neutrality, like Senators Corey Booker (D-NJ) and Al Franken (D-MN). Not only is net neutrality a freedom of expression issue, it’s also a political and economic issue, as lower-income people could have less access to valuable information. For more information, and to send a letter to the FCC and Congress, click here. Last month, U.S. Education Secretary Betsy DeVos froze two Obama-era regulations aimed at protecting student loan borrowers from predatory for-profit colleges. Portions of the rules were set to take effect on July 1, but the Department of Education has created new committees to review, dismantle and re-write the existing policies. One of the recently revised rules in question, the 2014 Gainful Employment Rule, enforces the Higher Education Act’s requirements that all career education and certification programs receiving federal student aid (including both private and public schools) provide graduates with eligibility for “gainful employment” in the field of training. In order to assess this, the rule reviews the level of a graduate’s student loan debt as well as the amount they are making in the job they obtain immediately following graduation. The rule was designed to ensure that schools aren’t excessively burdening their students, or setting them up with mountains of debt and lousy job prospects post-graduation. If the ratio of school debt-to-income is too high and graduates aren’t eligible for jobs in the field, the program is marked as “failing.” A program that fails two out of three years loses its federal funding. Since many for-profit colleges receive up to 90 percent of their funding through federal student aid, continually failing schools would likely be forced to shut down. Since its revision in 2014, and up until its recent delay, the gainful employment regulation was showing a significant positive impact: Colleges were choosing to eliminate their worst performing programs and implementing internal reforms to improve outcomes for their graduates. At the same time, the rule brought to light scores of failing programs currently subsidized by taxpayers. The Congressional Budget Office estimates that repealing the rule would waste taxpayer funds, costing taxpayers $1.3 billion over the next 10 years.The second rule, Borrower Defense to Repayment, was finalized in October after two years of public scrutiny, negotiations and review. The rule was clarified after tens of thousands of students, defrauded by for-profit Corinthian Colleges, applied for federal student loan forgiveness following their schools’ collapse and abrupt closure in 2015. The defense to repayment process allows defrauded students who can show that a school used illegal or deceptive tactics to persuade them to borrow money to file a claim to have their federal student loans discharged. The rule also bans for-profit colleges from using mandatory arbitration clauses in student contracts. 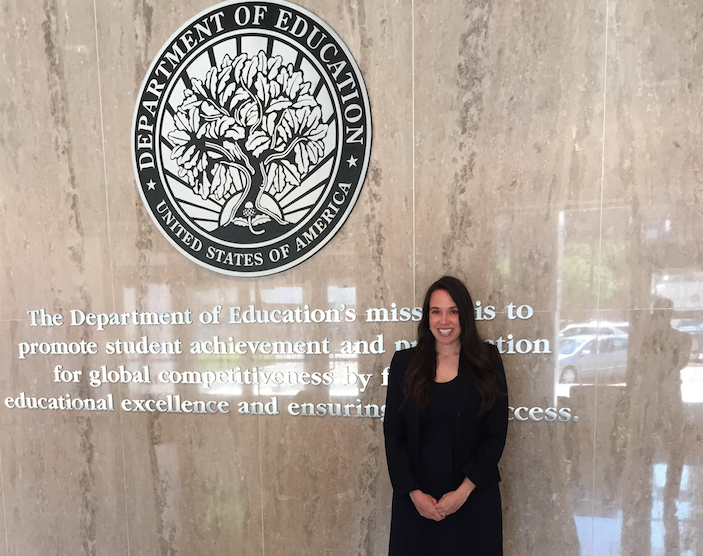 Consumer Action's Alegra Howard prepares to testify at the Department of Education hearing in Washington, DC, last month. While the Department of Education has not outlined next steps for the newly negotiated rulemaking process, it has announced that it is seeking further input on other student loan borrower regulations that may be appropriate for repeal, replacement or modification. (You may submit your own public comments here.) In the meantime, Consumer Action will continue to stand up for strong student loan borrower protections and fight the Department’s attempts to weaken and replace critical for-profit school regulations. RJ* of Florida called Consumer Action’s hotline to complain that he tried to sell a “viatical settlement” investment he purchased in 2001 through a company called Mutual Benefits Corp. A viatical settlement is the sale of a life insurance policy to a third party. RJ said he started to question the figures in the statements the company sent him and inquired about selling out. But he was told he couldn’t sell the investment. In a viatical settlement, the owner of the life insurance policy (the “viator”) sells the policy to a firm for cash. The firm, in RJ’s case Mutual Benefits Corp., is entitled to future payments when the beneficiary dies. This process is similar to how winning plaintiffs in court cases may sell the rights to their future settlement checks, for damages awarded by the court, to receive immediate money from a buyer (called “structured settlements”). In either case, the cash payout to the seller typically is only a fraction of the amount that would have been paid out if the owner had waited (died or not sold their future settlement, respectively). In the case of life insurance, the owner’s beneficiaries would have received a larger life insurance payout. The firms that buy out insurance policyholders and plaintiffs often package the resulting income streams and sell them to investors, who receive a portion of the funds as they are paid out. The returns look high compared to other investments. Unfortunately, the industry is rife with scammers and the firm RJ dealt with was one of the fraudsters. In 2004, the U.S. Securities and Exchange Commission (SEC) halted a billion-dollar securities fraud by Mutual Benefits Corp. and its principals, including mastermind and CEO Joel Steinger, for bilking 29,000 investors worldwide. The SEC charged that the defendants raised over $1 billion from investors through a fraudulent, unregistered offering of securities in the form of fractionalized interests in viatical settlements. A U.S. District Court in Florida froze the company’s assets and placed Mutual Benefits Corp. in receivership. Viatical investing is highly risky. In certain instances, the face amount of the policy may decrease if the named individual lives longer than expected; in other cases, the policy value could be lost completely if the buyer doesn’t pay the premiums as required. Another big negative: The National Association of Insurance Commissioners says viatical settlements are not “liquid” investments. This means you can’t “cash in” your principal if you change your mind. There is no return on your investment until the insured dies and the death benefit is paid. (A similar issue exists for structured settlement investments, which are long-term—up to 20 years—and almost impossible to sell.) In addition, commissions may be very high on these investments and your rights to the income stream could face legal challenges. The National Association of Insurance Commissioners offers tips on its “Insure U” consumer education site. The SEC and the Financial Industry Regulatory Authority (FINRA) offer an investor alert on settlement investments. Consumer Action and the Consumer Relations Consortium (CRC) cohosted two June debt collection webinars for Consumer Action’s network partners and professionals affiliated with the Association for Financial Counseling & Planning Education (AFCPE). The webinars, entitled When a collector calls: An insider’s guide to responding to debt collectors, provided participants with an opportunity to learn from experts from the CRC as well as Consumer Action staff. The webinars offer community-based organizers who work directly with consumers an “insider’s perspective” on how to start a dialogue with a legitimate debt collector, and how to spot a scam. The CRC is a group of 30+ debt collection firms that care about collecting the right amount, from the right person, the right way, according to Stephanie Eidelman, co-executive director of the Consumer Relations Consortium. A total of 125 community partners participated in the webinars. Leslie Bender of BCA Financial Services and Katie Neill of ARS National Services Inc. provided the insider prospective on how to effectively communicate with legitimate collectors, protect one’s rights and avoid scams. The collection experts played two sample calls during the webinar to show attendees what a successful call sounds like and how failing to provide pertinent information can result in an unsuccessful call and additional collection activity for consumers. Consumer Action’s complaint hotline and comprehensive website. Consumer Action developed its When a collector calls: An insider’s guide to responding to debt collectors publication in partnership with CRC in 2015. The publication is available in English and Spanish. Participants were surveyed following the webinar. A full 96 percent said they found the webinar helpful and they’d like to receive further online training on debt collection. Like the federal Lifeline program, California LifeLine provides discounts on phone service for qualifying low-income households. The program provides a vital subsidy that enables consumers who otherwise could not afford to maintain telephone service to get and stay connected—with family members, doctors, social workers, friends, teachers, employers and others. Since its initial publication in 2011, Consumer Action’s 16-page guide, Connect to California LifeLine and Save!, has helped thousands of the state’s eligible consumers take advantage of the invaluable program. Updated annual income limits (valid from 6/1/17 through 5/31/18). Connect to California LifeLine and Save! is available as a free PDF download in five languages—English, Spanish, Chinese, Korean and Vietnamese—from the Consumer Action website. Consumer Action has been a staunch advocate for California LifeLine, actively educating consumers so that eligible households can take advantage of the program, and advocating for program protections and improvements. Consumer Action’s executive director, Ken McEldowney, chairs the advisory board that provides recommendations on the Lifeline program to the California Public Utilities Commission (CPUC). Each year, TODCO Group, a community-based housing/community development non-profit corporation operating in San Francisco's South of Market neighborhood, holds its Yerba Buena Senior Ball, inviting elders from neighborhood senior housing to enjoy a free lunch and entertainment and to socialize with others while receiving helpful financial information from local non-profit organizations. Consumer Action was in attendance at this year’s “Dancing Around the World”-themed senior ball. 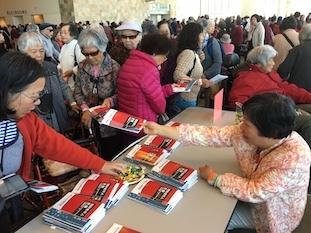 Consumer Action's Jamie Woo hands out Chinese-language materials at last month's Yerba Buena Senior Ball in San Francisco. Ninety percent of senior ball attendees are Chinese-Americans, so TODCO invited about 15 non-profit organizations that provide free Chinese educational publications to take part. Consumer Action’s Cui Yan Xie and Jamie Woo gave out more than 300 packets of Consumer Action’s financial and consumer education brochures (a total of 1,800), including ones on senior scams and ID theft; banking; money management and retirement planning; internet safety; and choosing and using mobile devices. Consumer/privacy groups weigh in on 2017 privacy bills. Privacy and consumer rights organizations commented on broadband and internet privacy bills recently introduced in the Senate and House. The groups noted that privacy is a fundamental right of all Americans, including our most vulnerable. Learn more. The FCC could do more to block pesky robocalls. Consumers received 2.4 billion in unwanted telemarketing and robocalls in 2016. Robocalls are the biggest consumer gripe filed with the FCC, which receives 200,000 complaints annually about them. Fortunately, new FCC rules allow telecom providers to block calls coming from invalid numbers, unallocated numbers and numbers whose owners have requested they be blocked. But advocates, including Consumer Action, are urging the FCC to do more to reduce the scam calls. Learn more. No room for ideological riders in our nation’s budget. Earlier this year, hundreds of riders (additional provisions added to bills in Congress)—most of them special favors for big corporations and ideological extremists—were proposed as part of the FY17 omnibus process. Advocates blocked most of them. Now, with the FY18 budget process underway, anti-consumer riders are rearing up again. The letter writers maintain that these measures, which have nothing to do with funding our government, have no place in the appropriations process. Learn more. The CFPB champions consumers over Wall Street once again! The Consumer Financial Protection Bureau (CFPB) finalized a new arbitration rule to prohibit banks and lenders that break the law from stripping customers of their constitutional right to join together and hold them accountable in class action lawsuits. Without the CFPB arbitration rule, bad actors like Wells Fargo will continue to pocket billions in stolen money and, in fact, gain a competitive edge in the marketplace by harming consumers. Unfortunately, House Republicans are already moving to repeal the rule, and Consumer Action and its allies will be fighting those efforts. Learn more. Trump favors for-profit college industry over defrauded students. The Trump Administration’s decision to delay and dismantle key student and taxpayer protections against fraudulent for-profit schools is terrible news for struggling student loan borrowers and a boon for the for-profit college industry. Student, consumer and veteran organizations wrote to the Department of Education denouncing its decision to delay and weaken the borrower defense and gainful employment regulations because they protect both students and taxpayers from waste, fraud and abuse. You can read the story above, titled “Consumer Action testifies in support of defrauded student loan borrowers,” for an in-depth take on the issue, and view the letter here. The above California consumer is one of the many satisfied users of the Consumer Financial Protection Bureau’s (CFPB) complaint process. In its most recent complaint report, the CFPB breaks down the type and number of complaints in its database by state. It also identifies the primary financial problems reported by servicemembers and older Americans. In Alaska, Alabama, Arizona and Arkansas, the top complaint is debts complainants say they don’t owe, while student loan and credit reporting complaints have grown the most in many other states. Meanwhile, mortgage problems ranked highest in California, Connecticut, Massachusetts and Florida. For a look at your state’s breakdown, click here. Consumers contact the CFPB for help resolving the financial complaints that they’ve been unable to solve directly with the companies. Consumers can choose to include the details of their complaint in the CFPB’s public database in order to warn others of their experiences. These complaint details (with all identifying information removed) help other consumers avoid companies with a pattern of bad practices or unresolved complaints. As the CFPB celebrates its sixth anniversary, it can boast that it has handled nearly 1.2 million complaints about credit cards, mortgages, bank accounts and services, student loans, car loans, credit reporting, money transfers, debt collection and payday loans. To report a complaint, call 855-411-CFPB (2372) or click here. To help compensate them for their losses, more than 10,000 struggling homeowners who received no relief after paying expensive loan modification fees will receive a portion of $18.3 million recently awarded the CFPB. A Wisconsin federal judge also ordered the now defunct law firm Mortgage Law Group LLP to pay the CFPB a $20.8 million penalty for violating the law and duping consumers. The CFPB charged the law firm with misrepresenting and falsely advertising its services as well as collecting large fees from homeowners without refinancing their mortgages. The foreclosure prevention firm is also barred from ever functioning as a debt relief business again. The CFPB has reached a $1.5 million settlement with four California credit repair companies that it says charged fees to review and repair consumers’ credit records before achieving results. In pursuing the case, the CFPB cited federal law (the Credit Repair Organizations Act), which states that credit repair companies cannot request or receive payment until they’ve completed the services they’ve promised consumers. Additionally, the CFPB pointed to the Federal Communication Commission’s Telemarketing Sales Rule, which states it is illegal to charge someone for credit repair until six months after a company has lived up to its repair promises. The CFPB also accused the firms of misrepresenting their benefits to consumers, promising to remove “virtually any negative information” from credit reports and inflating their ability to improve credit scores. The Bureau also accused the companies of misleading consumers with a money-back guarantee that was available only under limited circumstances. As part of the settlement, the four firms—Commercial Credit Consultants (also operating as Accurise), Prime Credit (also known as Prime Marketing LLC and Prime Credit Consultants), IMC Capital and Park View Law—are banned from the credit repair industry for the next five years. A separate but related lawsuit with a related company, Prime Market Holdings, is ongoing. The CFPB warns consumers: “Don't pay upfront fees and don’t buy any company’s claims guaranteeing that they can remove negative information from your credit file!” Click here for these and other CFPB tips on how to deal with credit repair company claims that are too good to be true. Of note this month is the class action Cody, et al. v. SoulCycle Inc. SoulCycle is an indoor cycling fitness company. Plaintiffs filed a class action against SoulCycle, alleging that the company violated the Electronic Fund Transfer Act, California Consumers Legal Remedies Act and California Unfair Competition Law. SoulCycle sells packages (SoulCycle Classes) allowing users to register in advance for specific classes, but the packages are good only for a limited time. Plaintiffs claim that the sale of SoulCycle Classes is in reality the sale of a “gift certificate” under state and federal law and, as such, existing expiration dates on the SoulCycle classes violate state and federal gift certificate laws. SoulCycle argued that the purchase of the SoulCycle Classes was different from the purchase of gift cards. The company denied the allegations but agreed to a settlement to avoid the burden, expense and risk of continuing the lawsuit. The settlement resulted in a $500,000 fund and mandated changes to SoulCycle’s business practices. Moving forward, SoulCycle must distinguish between SoulCycle Classes and SoulCycle Gift Cards and emphasize that SoulCycle Classes expire while SoulCycle Gift Cards do not expire. (2) Between Feb., 1, 2012 and Feb. 10, 2017, you purchased SoulCycle Classes for use in California and didn’t use them before the listed expiration date. The settlement provides either a reinstated class or cash option. Members who choose the class(es) will automatically receive it/them in their SoulCycle account. (If they bought more than one expired class, they will receive two classes in their SoulCycle account.) Members who choose the cash option will receive up to $25 per expired class, with a maximum of two expired classes (up to $50 total). To receive the cash option, members must submit a claim by the claims deadline. The claims deadline is Sept. 11, 2017. Energy loans from Ygrene or Renovate America. PACE (Property Assessed Clean Energy) loans are private loans that homeowners can use to fund energy efficient improvements, such as window insulation or solar panels. Ygrene Energy Fund, Inc. and Renovate America, Inc. are two of the largest residential PACE loan lenders in the country. According to consumers, Ygrene Energy Fund, Inc. and Renovate America, Inc. misrepresent the nature of the PACE loans they offer by leaving out key details, like the fact that the loan attaches only to the property—not the consumer. Among other misleading statements, the companies also led property owners to believe that they could easily transfer the loan to a new buyer with zero complications. In addition, consumers have complained that the employees and agents of Ygrene Energy Fund and Renovate America create a sense of urgency with customers during the application process (which leaves little room for proper disclosures and consideration about the serious financial commitment the consumer is making). If you obtained a PACE Loan from either Renovate or Ygrene within the past four years, you may be interested in learning more about this potential class action. VIZIO Internet Apps Plus (VIA+). Beginning in mid-2013, VIZIO manufactured and sold a large number of television sets featuring the VIZIO Internet Apps Plus (VIA+) platform. The TV sets were equipped with 512MB of DRAM memory (high definition models) or 768MB of DRAM memory (ultra high definition models). These television sets would routinely buffer video content and force a step-down in resolution, delivering only standard definition video content. According to VIZIO, this occurred because of a consumer’s slow internet connection. However, this process occurred for consumers with fast internet connections too (and even for those with wired connections). You may be interested in learning more about this potential class action if you purchased a VIZIO television model with the features described since 2013. Water pipe damage from LG and Kenmore washers. LG and Kenmore Elite (owned by LG) produce a significant number of front-loading washing machines with a design flaw that causes “water hammer” issues (banging or thumping in the water lines). If left unresolved, water pipes could become weakened and crack, allowing water leakage. In order to solve this problem, consumers who purchased defective washing machines have no choice but to purchase and install water hammer arresters in their plumbing. If you bought an LG or Kenmore Elite front-loading washer within the past four years and have experienced water hammer issues, you may be interested in learning more about this potential class action. LG TrueBalance. LG produces a significant number of washing machines with TrueBalance technology. According to LG, this technology allows the washing machines to be “energy efficient” and is “designed to reduce washer noise and vibration for smooth, quiet performance...” However, many consumers have complained that this same technology forces these washers to constantly “rebalance,” using up much more energy and water than promised, and has resulted in consumers needing to pay for new control panels and/or software fixes (out of their own pocket). If you own an LG washer with TrueBalance technology and you have seen the error code “UE” flashing on the machine’s display screen, you may be interested in learning more about this potential class action. ‘Actual cash value’ insurance. When property covered by a property damage insurance policy is damaged in a covered event, the insured may elect to receive the actual cash value (ACV) for the cost to repair or replace the property with new materials of like kind and quality before (and regardless of whether) repairs are undertaken. Property damage policies generally do not say that “actual cash value” excludes a general contractor’s overhead and profit (O+P), despite the fact that a number of insurance companies have made it a policy to exclude O+P when making ACV payouts. If you: live in Arizona, Michigan, Pennsylvania, Tennessee or Texas; had a property damage policy; experienced property damage and elected to receive an ACV payment; but did not receive money for a general contractor’s overhead and profit, you may be interested in learning more about this potential class action. EZ-FLO braided water supply lines. EZ-FLO International, Inc. designs, manufactures and sells braided stainless steel water supply lines for homes and other buildings. Unknown to customers, these water supply lines were designed with plastic coupling nuts that routinely crack and/or fracture during their ordinary and intended use, thereby allowing water to escape. Even after learning that failures of the water supply lines’ coupling nuts resulted in substantial damage to homeowners, EZ-FLO did not publicize that the water supply lines were defective; recall the defective water supply lines; or notify property owners that the defective water supply lines should be replaced. If you purchased EZ-FLO braided stainless steel water supply lines and experienced water leakage and property damage when the plastic coupling nuts cracked and/or fractured, you may be interested in learning more about this potential class action. If you would like more information about these cases, contact Bryan Clobes (215-864-2800) at Cafferty Clobes Meriwether & Sprengel LLP.